So it's getting to that time of year where a lot of you will be off to University ready to start studying in a different city/town quite far away or maybe in a place near to you. Either way you are going to be excited but also nervous. 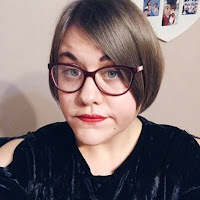 As I have been and done University (and I am going back in September to do my MA) I thought I would write a little checklist and give some tips for those of you who are going. I will split the list into little sections just to make it easier to you to look at and read. I really hope this is beneficial! For many of you you will be moving away from home and moving into student accommodation. This can be quite daunting at first and you will get homesick (I'm not going to lie, I did). However, you will soon learn that living independently does have its advantages and you could very well meet your next best friend in your accommodation. - Kettle: Most student accommodation don't provide kettles in the kitchens so you may need to bring one. However it is best just to check. Also, maybe try talking to your future flatmates if you can and decide who will bring one as you don't want a lot of kettles in the kitchen. - Toaster: Like kettles most places do not provide toasters so you may well need one. However, just like with kettles it is best just to check. - Plates/Bowls/Mugs/Glasses: This is pretty obvious but you are going to need these essentials if you want to eat/drink. You can get some pretty cheap ones from supermarkets, discounts stores and most places do sales/offers on them come September. - Cutlery: Same as above. - Kitchen Utensils: Such as saucepans/frying pans/colanders/chopping board etc. These can also be picked up at cheap prices. - Washing Up Liquid/Cleaning Products: Just because you are a student doesn't mean you need to be messy. Cleaning the kitchen and washing up isn't just hygienic it makes the place more inviting when you want to socialise in there. - Food: Another obvious one. Before I moved into my accommodation I went for a big shop with my parents. If you get a big enough shop it can last you for a few weeks. - Try and arrange a clean up rota with your flatmates, this makes sure that everyone is doing their fair share. - Empty the bins when they are full. There's nothing worse than overflowing, smelly rubbish. - Recycle! Most universities now have recycling schemes and will usually have recycling bins in their accommodation. It's helping the environment! - Cook with your flatmates! It will save money and give you all a chance to get to know each other. Your room at University is your own private place where you will do most of your studying and chill out with friends or on your own. What you have in your room is mainly personal preference, but here a few items that you will need and may want. -Bedding: Duvet, Pillows, Mattress Protector, Bed Sheets etc. The university will not provide these. If you are strapped for cash you can pick these up cheap from supermarkets, discount stores etc. - Bathroom/Toiletries/Towels: If you have an ensuite in your room you will definitely need these. I loved having an ensuite in my accommodation. - Posters: This may help you put a personal stamp on your room. I know it did for me. - Photos from home: This will certainly help if you are feeling homesick. Put them up around the room and when you are feeling low, look at them. You will feel better, trust me! - Tidy! This isn't just hygienic, but some universities will do random checks so it's always best to make sure it's in good condition. - Make sure all your electrical equipment is in good condition. Universities will do checks at random times to make sure your electricals aren't faulty. You are at university to study and get a degree, although sometimes it may not seem like that. You will obviously need a few bits to help you get started. 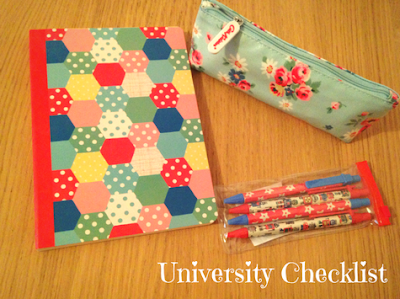 - Notebooks: You will be making notes in lectures so a notebook is essential! Notebooks can be as pretty or plain as you like. I would recommend going to Paperchase if you want pretty ones! - Pens/Pencils/Pencil Case: Same as above. You will find that you will go through a lot of these items throughout your time at university as they always seem to disappear! - Folders: To keep your notes from lectures and any handouts safe. Otherwise they will just get lost or crumpled. - Printer: Printing at University can get quite expensive so I would recommend getting your own printer. - Laptop: I suppose this is pretty self explanatory. - Planner: Getting a planner may help you plan your assignments and help you become organised. A wall planner may be the best as you can stick it on a wall and it's there in front of you. - Have a schedule. Having a schedule is important and keeps you organised with regards to lectures, assignments etc. - If you are struggling get help! Remember you aren't alone and Tutors are there to help you in anyway they can. They want you to succeed. - Check your timetable. This will help you know where you need to go in case there are date/room changes. - Study with people! Having friends that you can study with may make the whole experience seem less stressful and you can bounce ideas off each other. Here are a few other things that you may need and some tips. - First Aid Kit: You may hurt yourself so having a first aid kit is pretty essential. - Alcohol: You are a student, you may want a drink. - Student Bank Account: Student bank accounts are great as you get a pretty good overdraft which you may need to use. Go into your bank branch and ask about them! - Personal Items: I won't give specific details on this but you know what I'm talking about. - Take part in events during Freshers Week. These events will help you socialise, meet new friends and just have fun before the hard work begins. - Join a Society. You don't only meet like minded people you get to have fun! - If you are feeling down, talk to someone! All Universities are required to have counselling. I had counselling in my third year and it really did help. - Keep track of your money. There's nothing worse than having an empty bank account and not knowing where your money has gone. - Get to know the local area. Go out and explore! I hope these tips help in someway and if you are off to University in September. Enjoy it! and have fun!